Although my entire surveying career has been in California, I believe that the following is true in almost every, if not every, state. With regards to the Priority of Evidence Rules (Rule of Construction), when conflicting elements exist when determining boundary location, coordinates are always at the bottom of the list. In my 30 years as a professional land surveyor, having resolved hundreds of boundaries, I cannot recall ever using coordinates for even the most trivial of purposes towards my final solution. Why would I? They are dead last on the list. Now that the focus of my career is centered on geodetic surveying, I have gained an entirely new understanding, respect, and value for the once-lowly coordinate. I am not talking about some local, assumed project coordinate that is likely temporary in nature, but an accurate and precise, repeatable and reproducible coordinate referenced to a documented and monumented reference frame, such as NAD 83, or a State Plane Coordinate system. Even in a complex geophysical state such as California, where things are moving somewhat rapidly in the horizontal, I now believe, given all of the pertinent meta data about how a specific coordinate was determined, that I could accurately and precisely reproduce that position on the ground to a high level of confidence, provided I was certain that how it was originally determined was correct and properly documented. So, how could I use this to retrace a boundary survey and actually give the coordinate a higher ranking on the list than things like directions or distances? If I did so, how could I possibly defend it? Oh, the travesty!!! Some may even call for my license simply for discussing this possibility. 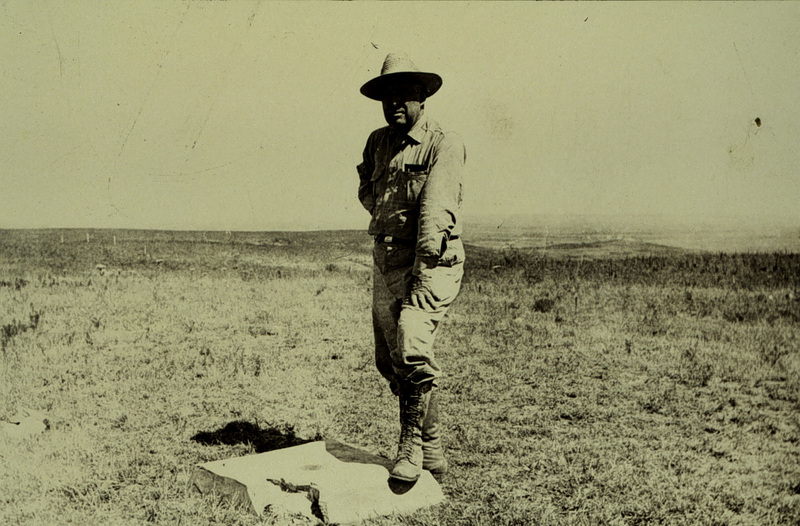 One of the highest-ranking elements on the “list” is an original, undisturbed monument. Okay, no problem. Even if it wasn’t set exactly where, mathematically, the map or deed says it was in relationship to the other boundary monuments, it holds, especially if the land owners have relied upon it as the true location of their boundary, or a point on it. If the physical character of the monument was sufficiently described in the original document, including any stampings on the cap or plug, chances are good that I will be able to determine whether the monument I find is likely the original or not. Based on my measurements and the quality of the original survey measurements, I may be able to confidently determine that it is also in its original, undisturbed location. Or maybe not. Triangulation Station at Meade’s Ranch circa 1940; credit: NOAA National Geodetic Survey – Historic Coast & Geodetic Survey Collection. What if it doesn’t fit well with the other monuments and lines of occupation, yet is nice and vertical, solidly in the ground, and not in a location where there are obviously reasons why it might have been disturbed, thus looking every bit “undisturbed”? What if both landowners tell me that it has been there as long as they have lived there, but that isn’t as long as since it was first set? Do I accept it? Do I reject it and set my own at the correct mathematical location relative to the other corners? I probably would accept if it were less than a foot out of position in most of the locations where I have practiced (depending), but what if it was 2.5 feet out? The last thing I want to do is to pincushion an original undisturbed monument simply because I can measure better than the original surveyor could. What to do? Well, what if the original surveyor had tied their survey to the California State Plane Coordinate System of 1983 (CCS83) and included all of the required elements of doing so on the Record of Survey they filed? That would include the control used, positions held, epoch date, and other valuable information that I could use to recreate that coordinate on the ground and to check the other monuments included on the map. Without going into details of how I would do that in this article, let’s just say I was comfortable with how the original work was done and reported, so I commence to perform my “coordinate retracement” to help me with my dilemma over this monument. The coordinate retracement determines that all the other monuments are within 0.15 feet of their reported CCS83 positions, but the monument in question misses the reported position by 2.8 feet. I now believe that one of two things is true: 1) The monument is not in its original, undisturbed location or 2) a blunder was made when setting the monument originally. Because it does not fit the lines of occupation on the ground, I believe my decision would be to reject the monument as not being in its original location, thus not undisturbed, and set my corner at the coordinate retracement position, which fits occupation much closer, and reference the other monument on my Record of Survey. I believe that any other option would be less likely to put my corner where the original had initially been located. I can sleep tonight, even though I used a coordinate for boundary retracement purposes. Here’s one more scenario, but I can think of many. I have been hired to retrace and monument a boundary between two 20-acre parcels created by the same Parcel Map. There are several angle points along this line that were originally monumented, somewhat meandering down a natural swale. However, in no document or map is the boundary line tied to the center of the swale. Over time, the swale had become overgrown with wild berry bushes, and one of the prior owners brought in heavy equipment to remove them, thus completely removing the eight monuments along the line, too. Without coordinates, I would have to recover as many monuments as I could find and try to recreate, in a “best fit” sense, the positions of these eight monuments. But, as in the scenario above, if the original surveyor had properly determined and reported CCS83 coordinates for these eight monuments, I could use them, after verifying how the other monuments fit the coordinates, to set them very closely to where they had originally been with a high level of confidence that I had done so in the most defensible way possible. Again, a good night’s sleep. On construction sites, we give coordinates the highest level of importance for recreating positions. When a stake gets knocked out, we most often put it back in at the coordinate, right? With a robust national CORS system providing 24/7 access to the National Spatial Reference System, why don’t we routinely do the same for boundary corners? If we put accurate and precise coordinates on every monument we put in the ground, they could be reproduced in the same location in perpetuity, either by a future surveyor or even ourselves. I think, in 2016, that the lowly coordinate in boundary surveying isn’t getting the respect it’s due, like the late Rodney Dangerfield. First, a surveyor has to do the work to correctly determine and document them, but the value during future retracements could be higher than many of the other elements on the current list and prove or disprove some of the highest. Heck, the BLM has proposed using them in Alaska instead of monuments for original PLSS corners. Let the thought and discussion begin. I have my flame-retardant suit ready. For a more detailed discussion of this topic, please see the excellent article by Teresa Smithson here. What I find most useful here is to base boundary surveys precisely on coordinates instead of monuments that could get erased, defaced, or transferred. Should Grandpa’s ranch get surveyed for its boundaries, it would be good if the surveyor note only the biggest trees, the old wooden electric post, or the scarecrow as landmarks and work exactly on getting the proper coordinates of his 45-acre ranch. Survey documents then would be more valid longer even if the trees had been cut, the posts have been transferred and made into concrete, and the scarecrows turned into windmills.